Italy’s most picturesque coastline stretch; the Amafil Coast is renowned for its jaw-dropping Mediterranean beauty and coastal tranquillity. The UNESCO coastline road spans 60 kilometres and encompasses beautiful towns and villages, all with a unique culture filled with historic churches and quaint old houses. And you can road trip the entire coast by taking the Amalfi Drive; a winding road situated high on cliffs above the Tyrrhenian Sea. There’s a few must-visits on your Amalfi Coast road trip, and countless other small attractions to marvel at. 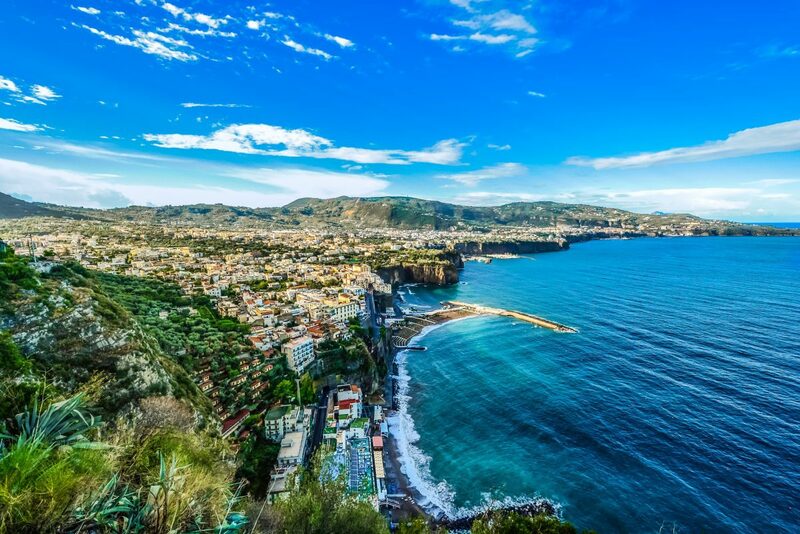 Beginning at one end, you can experience gorgeous towns and tranquil beaches, finishing in the lively beach town of Sorrento. Home of the world’s first medical school and with relics from Italy’s invasion during WWII, Salerno was for a short while Italy’s capital. The town boasts gorgeous architecture typical of Europe, with one of the best seafront promenades in Italy. There’s also a fairytale castle towering over the city from a hill; making the whole town seem enchanted. Hostel Recommendation = Ave Gratia Plena offers complimentary wifi, a laidback travellers’ atmosphere and bunks in 8 bed dorm rooms for 16 euros a night. The friendly staff will gladly assist you with any Amalfi Coast drive questions you may have and the location is excellent; right in the town centre. Ave Gratia Plena is a fantastic option for budget travel on the Amalfi Coast. Not a stop on everyone’s Amalfi Coast drive itinerary, but well worthwhile, is the cutesy village of Vietri Sul Mare. The village is famous for its variety of hand painted ceramics; including ceramic tiled storefronts which offer dishes, vases, urns and tiles within. The merry shops are a fantastic place for window shoppers, or perfect for anyone wishing to purchase souvenirs from the Amalfi Coast. Just be careful with any breakable objects in the boot of your car; the road can be very twisty and you won’t want any smashed chinaware! With some old Italian charms and authentic restuarants, Cetara is a must-visit for anyone keen to see the Amalfi before tourism. The town is an idyllic place to stroll around; and the fact that most of the accommodation options are basic B&Bs adds to the no-frills atmosphere. Budget Hotel = Hotel Cetara is the perfect destination for couples travelling together on a budget, and features free parking, wifi and breakfast. Minori isn’t the most attractive place on the Amalfi Coast, but is still well worth a stopover. 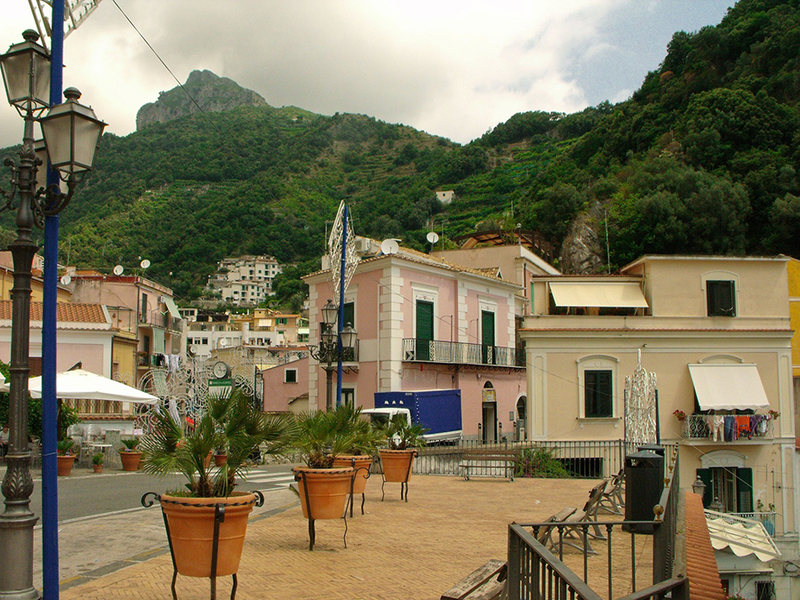 Visitors to Minori and nearby Maiori can enjoy authentic food, quaint Italian charm and Roman ruins. Combining a fantastic mix of authentic Italian culture and stunning beachfront, Ravello is a fantastic town to kick back in for a few days. The town is home to an 11th century cathedral and gorgeous villas. Ravello has attracted guests for decades, including D.H. Lawrence (the author of the scandalous book Lady Chatterley’s Lover) and composer Wagner. 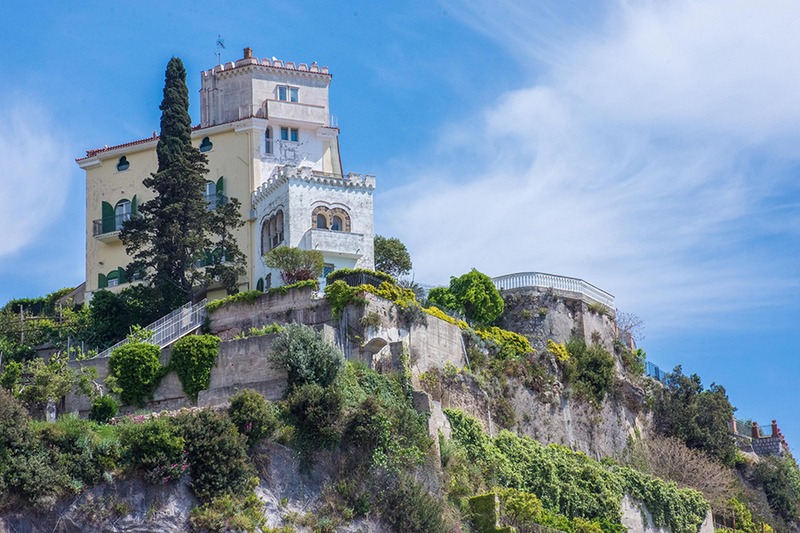 Villa Rufolo is an opulent building with the sea as a backdrop, and is where the annual Ravello Festival is held. 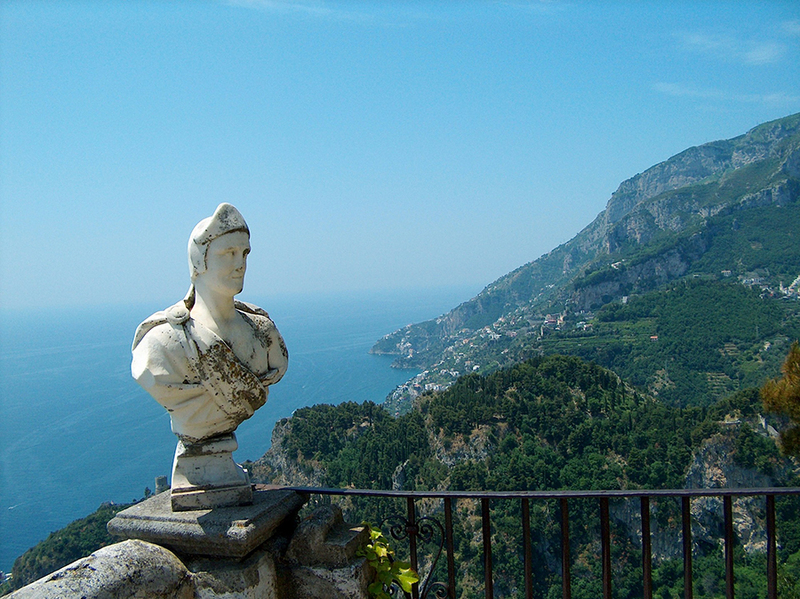 Another popular villa is Villa Cimbrone, which is home to gardens, temples, statues, fountains and a quaint terrace. Cheap eats = Villa Maria Restaurant is a fantastic merge of luxury atmosphere and bargain prices. Budget guesthouse recommendation = Al Borgo Torello is the cheapest guesthouse in Ravello by far. It’s 2km from the town centre but just 11 minutes from the beach. It offers free wifi and parking, and some rooms have a balcony overlooking the beach. Once one of Italy’s most powerful cities, Amalfi is a quaint town with delightful architecture typical of this area of Italy. Three of the must-do things in Amalfi include: the gorgeous Amalfi Cathedral which is home to the cloister of paradise. It was built in the early 1200s and showcases an Arab-influenced exterior and relics of St. Andrew the Apostle in the crypt. Experience the gorgeous Valle delle Ferriere – a wonderful valley which is available to be walked by foot from Amalfi city in under an hour – the entire valley is covered by a network of paths and it showcases many delightful waterfalls and streams. If seafood is your thing, enjoy some of the local delicacies by a seafood lunch washed down with a limoncello. Cheap hotel recommendation = Hotel Doria is a fantastic option for budget travellers seeking a bit of luxury. Each room offers air conditioning and satellite TV, with some featuring a balcony and sea views. Free wifi and parking are featured and there is a complimentary buffet breakfast. This cutesy little town has fantastic colourful murals and distinctly tasting wines. It’s a little way away from the coast but the atmosphere, remoteness and hiking trails make this destination a fantastic spot for those taking a little longer travelling the Amalfi Coast. Cheap hotel recommendation = L’Incanto is a large, clean hotel features a sun terrace and sea views, as well complimentary toiletries and hairdryers, as well as free wifi and parking. If you’re travelling with a pet, you’re in luck; dogs are permitted at this hotel. 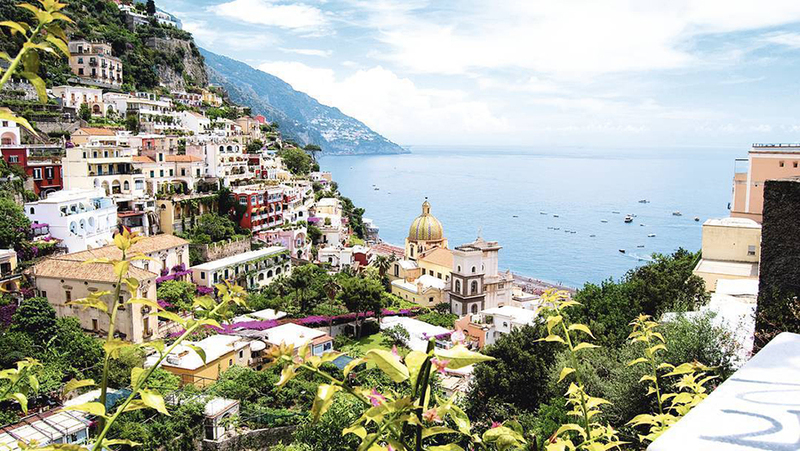 Positano is touristy, but you can’t miss it. Built into the side of a mountain, the village is adorned in pastel colors which dance and glow in the sunlight. Inside the village, there’s an intricate labyrinth of streets and laneways and from the shore you can spot Li Galli, an archipelago of islands off the coast. 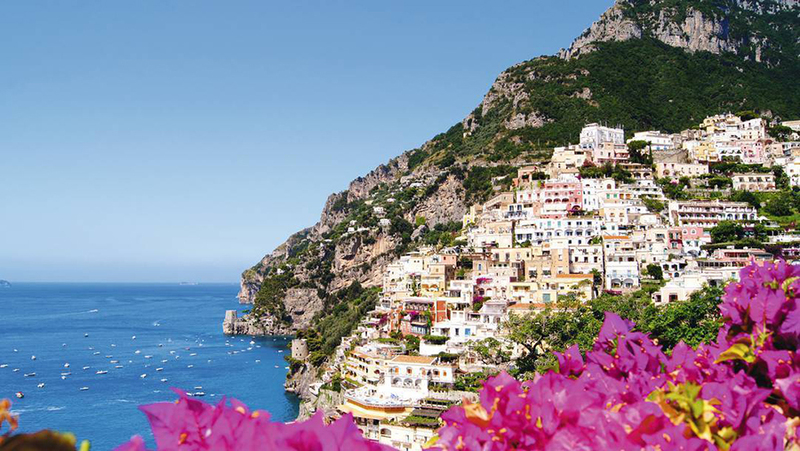 There are plenty of fun things to do in Positano. These include the secluded hamlet of Nocelle, purchasing a pair of made-to-measure sandals and walking the Sentiero Degli Innamorati from Spiaggia Grand to Fornillo beach; a gorgeous coastal stroll that offers breathtaking views of the Amalfi shores. If you have some extra time in Positano, you should definitely do the 7.8 kilometer LL Sentiero Degli Dei hike between this town and Agerola; which offers some of the very best views on the whole coast. Cheap eats = visit the town’s Delicatessen to enjoy some cheap food with fantastic vegetarian and vegan options. Positano is very expensive for accommodation – if you’re travelling on a budget, you’re better off staying in one of the towns either side. A bit of an off the beaten track location, but well worth it – especially for the outdoorsy types among us – Sant’ Agata sui Due Golfi overlooks Naples and Salerno bays and is a wonderful spot for hiking and enjoying some rural living. The Bendeictine monastery Il Deserto is a fantastic panoramic viewpoint of the whole area and is not to be missed. Where to eat: Lo Stuzzichino is a fantastic family run restaurant with local favourites and reasonable prices. Budget accommodation : Agriturissmo Fattoria Terranova is by far one of the cheapest accommodation options in the town. Sorrento is the end of the Amalfi Coast drive; but don’t worry, your adventure isn’t quite over yet! There’s lots to see within Sorrento that makes it a tourist destination in its own right. The Cathedral of Sorrento is centrally located and is a breathtaking building to explore. Old Sorrento is home to quaint crumbling streets and tiny alleyways, perfect for an afternoon’s exploration. 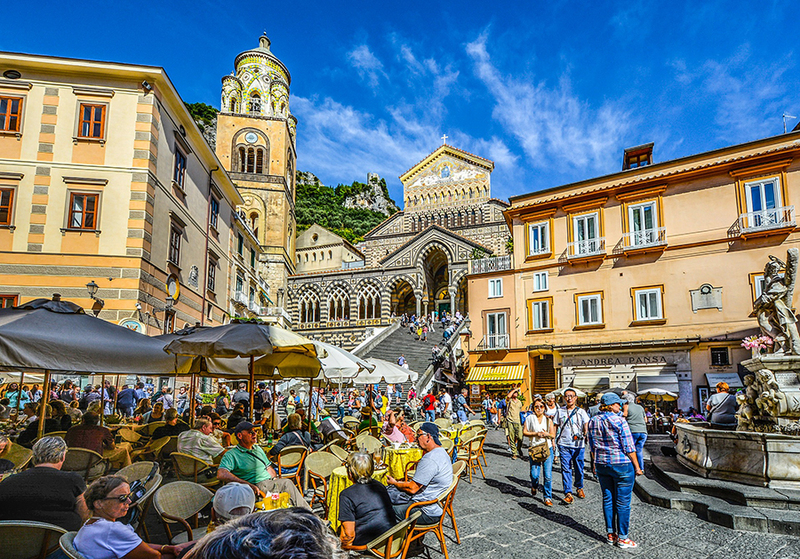 But if you’re feeling slightly frazzled after the Amalfi coast drive, then take a seat in one of the Piazza Tasso’s many cafes for a much needed caffine boost, take in the hubbub of activity and watch the world go by – pure bliss! Hostel in Sorrento – Florida Hostel and Hotel provides free wifi access, car parking and maps and travel info as well as having a fully stocked bar, swimming pool and helpful staff, Florida Hostel and Hotel can be your home away from home in Sorrento. 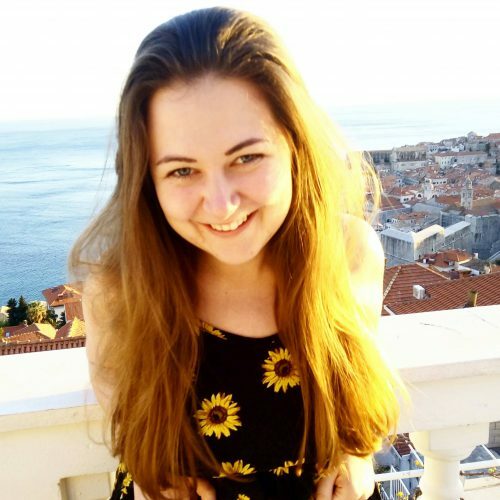 If you’re on a budget, dorms start from around 22 euros. 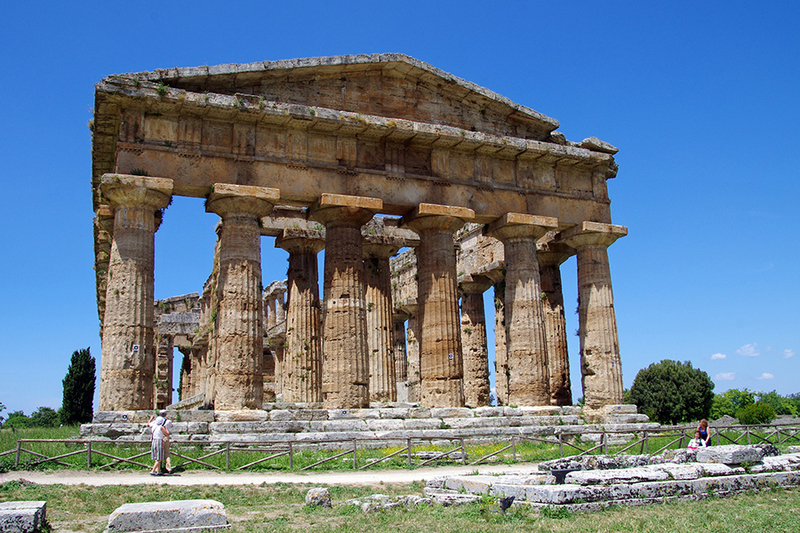 this huge site was an ancient Roman town and is one of the best places to relish in ruins of Roman times. Just an easy train ride away from Sorrento (or a car ride, if you still have your vehicle from your Amalfi Coast drive! 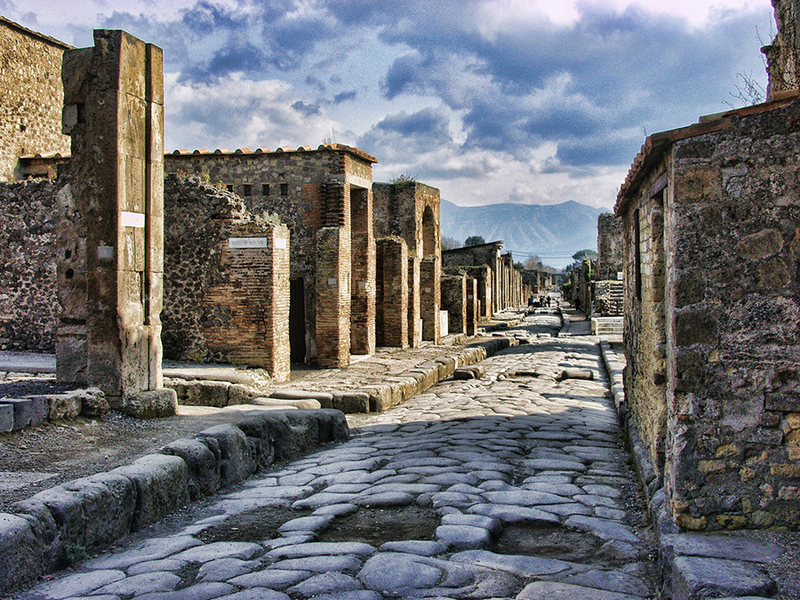 ), Pompeii Archaeological Site is a great day trip to learn about the ancient history of the region. Because of the site’s size, a full day is recommended to explore. There’s various tour options; self guided, with a head set, or with a tour guide. The idyllic paradise of Capri, just off the coast of the Sorrentine Peninsula, is a must-visit for any travellers to the area. Although you might wish to stay longer, the island can be explored in a day. Some of the best attractions are the famous Blue Grotto, Mount Solaro and the quaint Villa San Michele. If you have some spare cash, it’s worth investing in a private boat tour to see the grottos. While Blue Grotto is somewhat renowned, some of the other grottos are as beautiful and nearly untouched by tourists. Capri is a short and inexpensive boat ride away from Sorrento. Driving in Italy is an adventure to say the least. If you have little driving experience, it’s recommended to try driving elsewhere in Italy first. There’s a lot of buses, cars and motorbikes on the road, which makes for an occasionally hair-raising experience – the driver will need to ensure that their eyes are always glued to the road. Don’t be intimidated by the drivers on the Amalfi Drive; Italians typically drive very fast and will not be afraid to let you know if you’re going too slow for their liking! If this is the case, just drive to the side and let them past. That being said, don’t drive ridiculously slow; there’s so much traffic that it will cause a lot of aggravating congestion if one vehicle is travelling at a snail’s pace. If a Amalfi Coast Self-Drive isn’t for you, there’s the option of using the extensive bus network. It’s easy to use and covers the entire Amalfi Drive. Obviously, this gives you less flexibility, but it’s a great option for travellers who are keen to drive down the Amalfi Coast but don’t want to drive. Flying into Naples and travelling overland from there is the most cost-effective way to reach the Amalfi Coast, thanks to an array of budget airlines offering flights. If you are hiring a car, consider choosing a manual (stick) over automatic. Most cars in Italy are manual, and thus they are a lot cheaper to hire. 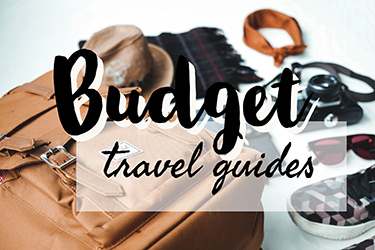 Alternatively, if you are on a real budget, consider taking a bus. 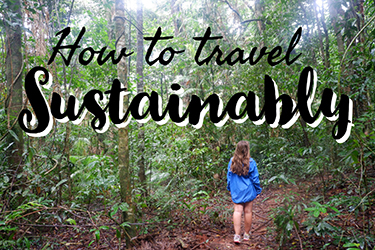 They work out to be a lot more cost-friendly and are a good option for backpackers or money savvy travellers. Be sure to take the day trip to Capri from Sorrento rather than Positano – ferries are a lot cheaper here. Le Sirenuse has a stunning vista over the shores, and the accommodating staff will let you walk in to take a quick picture free of charge. Don’t do the tours! 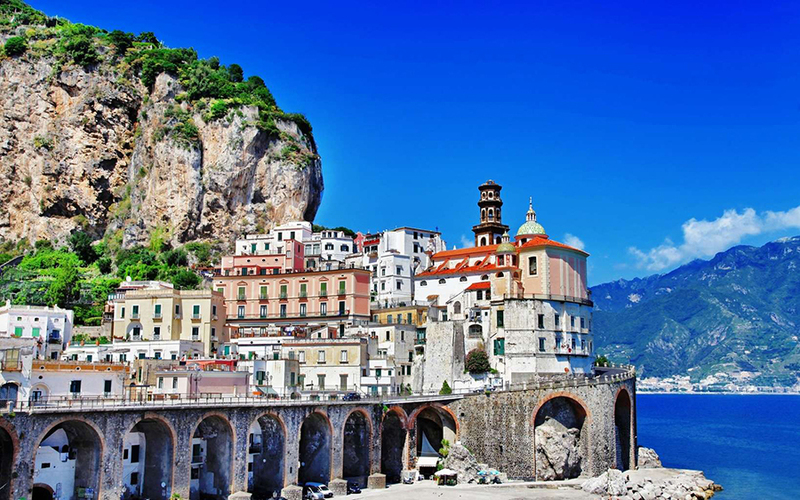 A lot of the Amalfi attractions can be enjoyed by simply walking around and relishing in the quaint villages and cities. Tours are unnecessary. There’s plenty of local restaurants away from the main touristy areas, that cost a fraction of the local price. 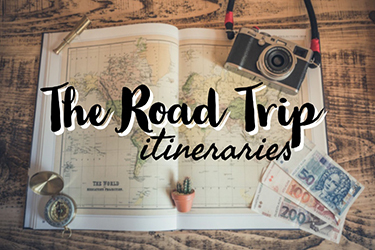 Hotels and guesthouses are notoriously expensive, but camping and hostels can be found along the road for much cheaper rates. Parking on the Amalfi Coast drive can be notoriously expensive, so it’s best to always opt for accomodation with free parking included.